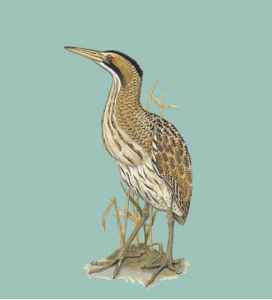 Physical characteristics: The Eurasian bittern is a thick-necked, medium-sized, golden brown wading bird. It has black feathers on its head and a black "moustache." These bitterns are between 25 and 31 inches (64 and 80 centimeters) long from beak to tail, and they weigh from 1.9 to 4.3 pounds (0.9 to 1.9 kilograms). The feathers on their backs are speckled, which helps them hide among the plants. Geographic range: Eurasian bitterns live in Europe, Asia, and Africa. Habitat: They breed among dense, close together, plants in shallow water. During the rest of the year, they spread out to other wet areas, including ponds, ditches, and rice fields. Diet: Eurasian bitterns eat fish, frogs, insects, small mammals, small birds, and snakes. They hunt by walking slowly among the plants, lifting their feet high with every step. Behavior and reproduction: When a Eurasian bittern spots a predator, it can "freeze" for hours, with its beak pointing upward and eyes pointing forward. It sways like a blade of grass, making it camouflaged (KAM-uh-flajd) among the plants. It defends its breeding and nesting area by making loud, booming noises and fighting on the ground and in the air. A male bittern may have as many as five mates within his territory. 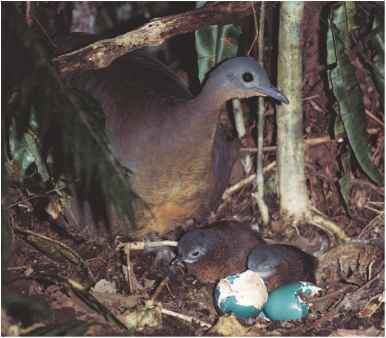 Each female usually lays four or five eggs and the young leave the nest two weeks after hatching. They can fly by the time they are fifty-five days old. Eurasian bitterns and people: As a result of the bittern's booming call, when it appears in folk tales and legends, it is usually wicked or it brings bad luck. Arnosky, Jim Watching Water Birds. Washington, DC: National Geographic, 2002. Hancock, James and Hugh Elliott. The Herons of the World. New York: Harper & Row, 1978. Williams, Winston. Waterbirds of the Northeast. Tampa, FL: World Publications, 1989. Allen, Willam H. Jr. "Travels of the Cattle Egret." Grit (October 13, 2002): 18-19. Berger, Joseph. "In City Bustle, Herons, Egrets and Ibises Find a Sanctuary." The New York Times (December 4, 2003): B1. Butler, Robert W. "Great Blue Heron, The Birds of North America, No. 24." The Academy of Natural Sciences, The American Ornithologists' Union (1992): 1-18. Hemingway, John. "An African Bird Makes its Move Around the World." Smithsonian (May 1987): 60-69. Horton, Tom. "Great Blues are Going Great Guns." Smithsonian (April 1999): 130. Kerlinger, Paul. "Out of the Blue: Forced South by Snow and Ice, Great Blue Herons in Winter are Adaptable and Unstudied." Birder's World (December 2002): 86-89. Miller, Claire. "Big Blues." Ranger Rick (June 1992): 20-26. National Audubon Society. "A Great Blue Heron Rookery in Weathers-field Has Been Restored." Audubon (March 2003): 119. Runtz, Michael. "The Great Blue Yonder." Nature Canada (Autumn 1999): 28-30. Telfair, Raymond C. II. "Cattle Egret, The Birds of North America, No. 113." The Academy of Natural Sciences, The American Ornithologists' Union (1994): 1-28.